The annual World Economic Forum (WEF) in Davos brings together hundreds of political and business leaders, with the aim of helping them collaborate and disentangle global challenges. It is truly global event, hosting over 3000 participants from 115 economies, representing every sphere of influence: governments, business, arts, culture, and the media. This year's forum, taking place between January 22-25, is entitled "Globalization 4.0: Shaping a Global Architecture in the Age of the Fourth Industrial Revolution." The fourth industrial revolution, is slowly and steadily sweeping across the world presenting a series of new challenges, and also opportunities. The snow-covered venue and its eerie calm provide a perfect setting for serious deliberations. However, the litany of challenges facing the world economy is enormous. The WEF is a leading voice for globalization but the phenomenon itself is under threat from different forces. The resurgence of protectionism and far-right nationalism have become serious threats. After decades of global economic integration, the entire edifice is creaking. A formidable hurdle is how to get global cooperation back on track, especially among the biggest economies. The problem is strategic as rising economies are also claiming a say in global politics and demanding a reshaping of the world order on a more equitable basis. It will not happen overnight, and thus delay the solutions of key economic and trade issues. The strain on the global system has been further compounded by the fourth industrial wave, the so-called digital revolution "Globalization 4.0." Digital technology offers the chance to speed up globalization through connectivity, but also increases the chances of confrontation. The challenge for the WEF is how to use its platform to make Globalization 4.0 different from the previous revolutions, which only helped a few nations get rich at the cost of others. Not only did the previous revolutions divide the world into first, second and third world nations, but also propelled inequality to staggering highs with elites arrogating many of the privileges and perks. 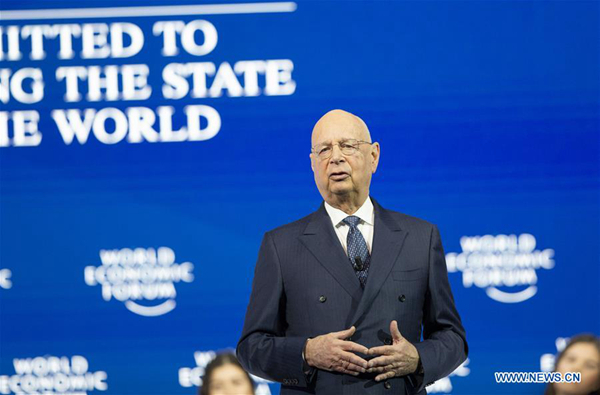 Professor Klaus Schwab, founder and chief executive of the World Economic Forum, has rightly warned about the danger: "We are entering a period of profound global instability brought on by the technological disruption of the Fourth Industrial Revolution and the realignment of geo-economics and geopolitical forces," he said. "This fourth wave of globalization needs to be human-centered, inclusive and sustainable," according to Schwab. The participants of the latest WEF may not be able to tackle all global challenges. But among them are experts and professionals who should use their expertise and imagination to propose some practical and out-of-the-box solutions. The WEF should streamline all good proposals by transforming them from policy parameters to an action-oriented framework. For example, China's Belt and Road Initiative (BRI) connects Asia, Europe and Africa on the pattern of ancient Silk Road and offers open-ending opportunities for those becoming part of the initiative. So far, dozens of nations have joined it and some are already reaping the benefits. Globalization 4.0 can use initiatives like the BRI as a window to promote prosperity. The WEF and other platform can contribute by mobilizing support to make the new revolution a common heritage. It can be done by placing the development of human capital at the center of every policy and initiative. There should also be focus on the reforms of the global institutions, as old mechanisms and bodies will not be able to cope with the demands of the new challenges.